Mayor Mallory will be there to kick things off at 10am at the corner of 13th and Republic. The tour, which is free and open to the public, takes place tomorrow (5/30) and will last from noon to 4pm. Those going will be able to tour the six new buildings being celebrated. The new units range in price from $140,000 to $350,000 with many boasting rooftop decks/patios that have spectacular city views. So far the nearly $84 million of investment that has occurred, in the Gateway Quarter, has created 86 new condos (66 sold) and some 50,000 square feet of street-level retail space. This latest phase will bring an additional 106 new units to the neighborhood. Roughly 12% of these are already under contract. Sounds cool, hope there is a good turn out. There is no better way to start changing people's perception than to actually get them down there! 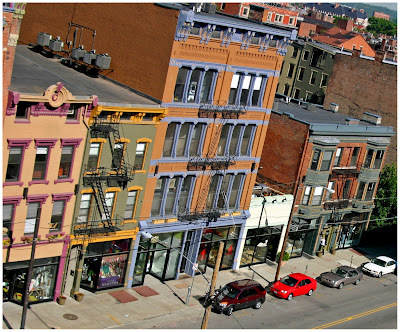 What is the difference between "Gateway Quarter" and Over-the-Rhine? Looking at the map the two seem, essentially, to be the same thing. "What is the difference between "Gateway Quarter" and Over-the-Rhine?" All of Gateway Quarter is in OTR but not all of OTR is in the Gateway Quarter. The Q is an area south of Liberty defined by a grouping of 3CDC owned buildings which includes condos, apartments and commercial space. Over the Rhine itself extends further north of Liberty to Mulberry. The Q continues to expand through the acquisition and redevelopment of more and more buildings. All of OTR benefits from this as it encourages developers and individual homeowners alike to invest in OTR. The more that do buy, the more that will buy and OTR, in large part thanks to the Q, is passing the tipping point whereas it seems more likely now for OTR to continue forward vs falling back to where it was. The Gateway Quarter is a district within the Over-the-Rhine neighborhood. Much like you have the Backstage or Fountain Square districts in Downtown.